▶ The Silicon Valley DeepTech Summit is the most important technology summit for global investors since the success of the F50's flagship global capital summit. ▶ F50 is a venture capital platform that searches for the most extraordinary companies in the world and connects them with a community of global investors, especially leading players from Silicon Valley and China. Its mission is to find and connect the next generation of world-changing companies with global capital & partnerships to power their long-term impact. 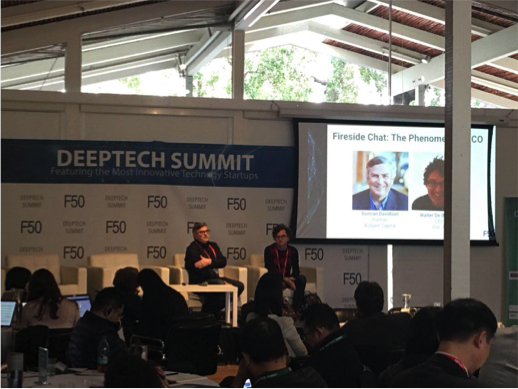 ▶ On January 16, CZV, as one of the well-known investment institutions in the Los Angeles area, was invited to attend the F50’s exclusive DeepTech Summit. Over 200 of Silicon Valley and China’s leading DeepTech experts and investors, as well as 35 sexiest DeepTech and HealthTech companies, gathered together and collaborated on the future state of DeepTech and HealthTech in Silicon Valley and discussed the latest market trends. ▶Enterprises that attended the summit are all top players in their fields, including Mindstrong Health, Neuro Therapeutics Inc, Doc.ai, Oculii, Skyworks Global Inc, Paxata, Element Analytics, Peloton, Maana Knowledge Platform, Dynosense, Zenflow, Mammoth Diagnostics, and so on, with business scopes covering healthcare technology, Big Data, Blockchain, AI, etc. ▶ Invited investors and guests include: NBA Angel Investor Baron Davis, Zhen Fund Partner Wei Jiang, Fusion Fund Founder and Managing Partner Lu Zhang, BlueRun Venture Partner Terry Zhu, UpHonest Capital Partner Wei Guo, ShunWei Capital VP Xing Meng, PPTV Angel Investor, Venture Partner Bill Yao, InnoSpring Founder Xiao Wang, and a large number of Top U.S. and Chinese investors and guests.